Unfortunately Windows doesn’t come with a default software to protect your private files and folders. Password protecting files is essential if there is confidential data, private data, or maybe to protect files from children. Last time I had put together a list of 10 freewares which help you to protect your private files. Well, today, I would like to add another application to the list- Androsa. 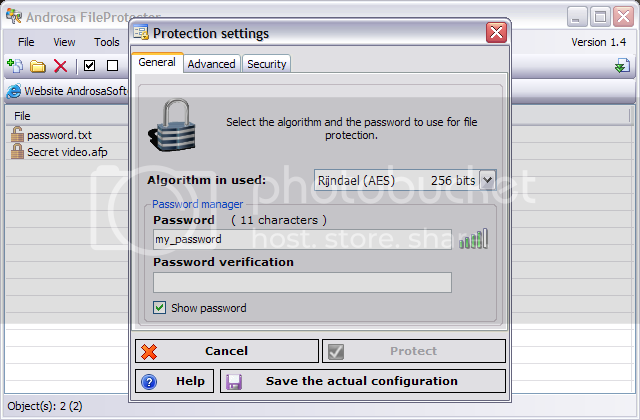 Androsa is a software which helps you to password protect any file in Windows. It’s also available as a portable version. You can either download it and launch the portable version directly or download the windows based installer and install it. Three different encryption algorithms can be selected to password protect the files including 256 bit AES encryption. The software is pretty straightforward and user friendly. You can add files using the file browser and password protect them in the next step. It will then encrypt the selected files and change their file extension to .afp. The software can also delete files securely by overwriting them a number of times. This is an important step as the original files will be deleted after the encrypted copy has been created. Androsa FileProtector will display a password prompt if the file is executed on the computer system.